Imagination is more important than knowledge. For while knowledge defines all we currently know & understand, imagination points to all we might yet discover and create. The landing point for the region is up in the air, and from the moment you arrive, the fact that you’re in a region that takes as its foundations Alice’s adventures is immediately clear – there is only one direction to take, and that’s down the rabbit hole! To proceed further, you’ll need to join the region’s group, which involves a slice of cake and a key. 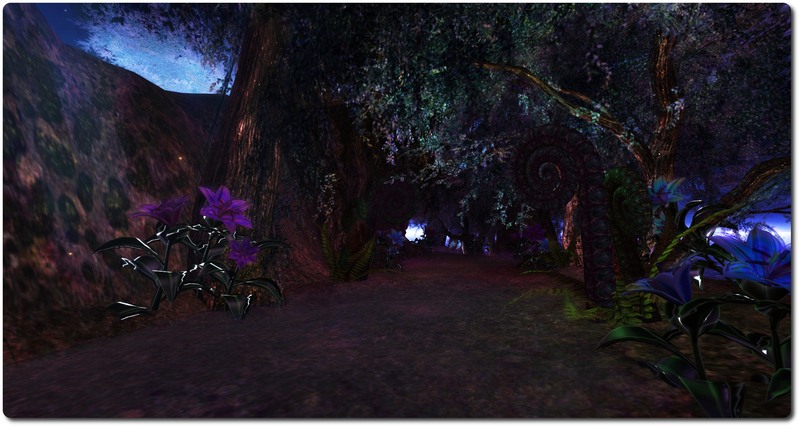 Once this has been done, you can proceed through the little door (an anywhere teleport door), which will deliver you to the region proper – but before you do, make sure you have either accepted the region’s windlight setting or have set your viewer to midnight or a nighttime windlight; that way you’ll experience the region as Muse intends. 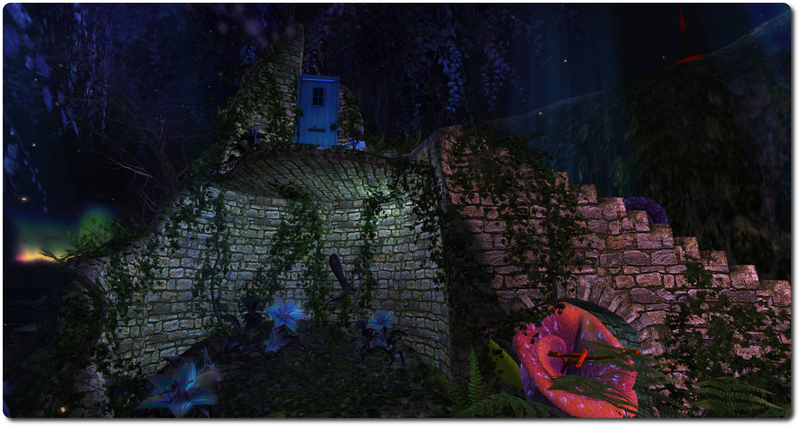 Now, as mentioned, this is a place that brings together fairytale, fantasy and elements of Alice’s adventures. 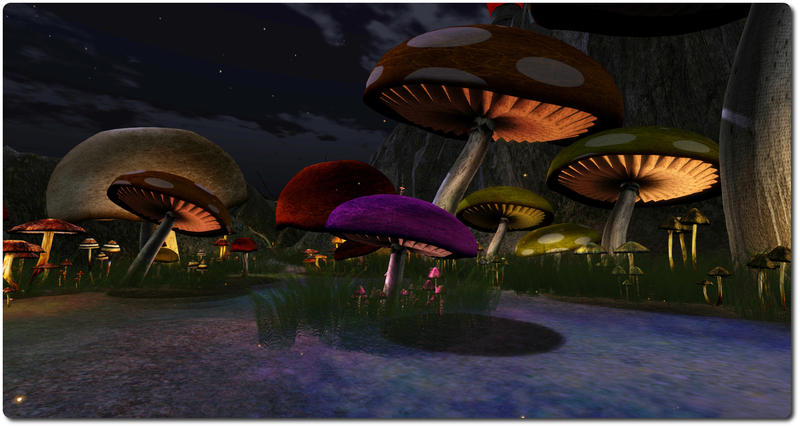 So in your travels you can make your way to the Enchanted Forest and Gardens, through the Wonderland Warren, visit the Mushroom Circle, sup at the Mad Hatter’s Tea Party and make your way to the Red Queen’s castle. However, not all here is quite as it seems. So if you find the Cheshire Cat’s grin a little unsettling, or the White Rabbit’s reading matter a little curious (not to mention the things he tends to hide under the fireside rug) or what happens when you accept the invitation to sit in his bedside chair leaves you a little uneasy, it is all entirely intentional. From the White Rabbit’s place, you can make your way through the swamp, under the gnarled trees and past the ghost. Then, if you hang a left at the bloody red glow, you can make your way up to the Red Queen’s castle. Or, if this isn’t to your liking, the continue on and you’ll reach the Mushroom Circle, and from there it is a short walk to the Mad Hatter’s tea party. 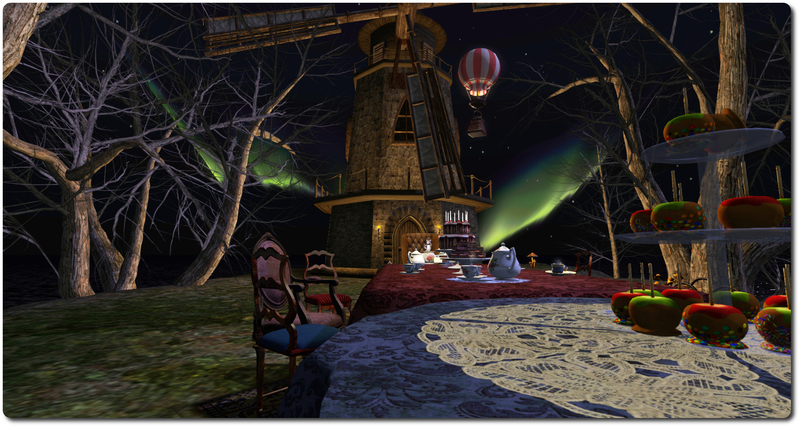 Despite the darker elements to it, this is actually a quite delightful and enchanting region which can quickly captivate, particularly in the richness of detail and subtle touches – note the recurrence of the chessboard motif, echoing Alice’s looking glass adventures, and that of the deck of cards, reference her trip to Wonderland. Do please make sure you use the default or a nighttime windlight; if you don’t, you stand to miss out on a lot of the charm and whimsical elements of the region. Whether or not you are a fan of Lewis Carroll’s (or should I say Charles Dodgson’s?) classic, Dysphoria – Alice in Wonderland offer an intriguing and quite photogenic place to visit, and well deserving of its selection as an Editor’s Pick in the Destination Guide.